Are you considering getting back into shape, maybe lose a few pounds, or simply feel better both physically and mentally? Maybe you are looking to continue exercising and reaching new goals after your physical therapy has ended. Elkins Physical Therapy and Sports Injury Clinic offers wellness programs for all ages and physical fitness levels. So whether you are looking to start with some basic exercises or looking to enhance your athletic performance, our facility may be of service to you. 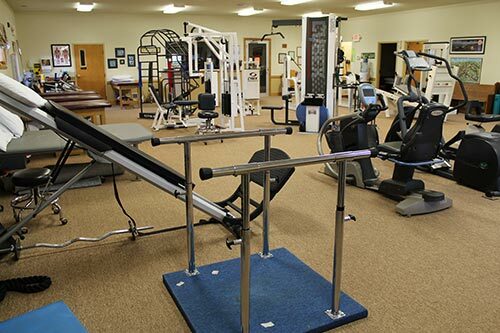 Our 1,800 square foot facility is filled with the best therapeutic exercise equipment including Cybex upper & lower body machines. We also have cardio equipment and an easily accessible heated therapeutic pool. If you are interested in more information on how our wellness programs can help you, give us a call today or fill out our online Contact form. At Elkins Physical Therapy and Sports Injury Clinic we are committed to helping our clients achieve a healthy lifestyle. Our personally designed wellness programs can help a wide variety of individuals achieve their goals and reach new physical fitness levels. We offer affordable, semi-supervised wellness programs that can be designed specific to your needs and goals. Our fun and friendly staff are ready to help you plan your program today. For more information, be sure to give us a call.